Part of the American Society of Travel Agents’ (ASTA) wide-ranging benchmark reporting program, the upcoming 2017 Independent Agents Report provides a snapshot of the independent agents community within the broader travel agency industry. 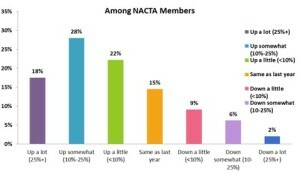 More specifically, about one in five NACTA members (18%) are showing that their businesses are up a lot (more than 25%) and just 17% of members are saying that their businesses are down so far compared to last year. 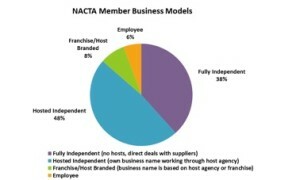 In terms of NACTA members’ business models, the largest share is Hosted Independent (with members’ own business names working through a host agency), accounting for about half of NACTA membership (48%), followed by over one-third (38%) of NACTA members being Fully Independent (no hosts, direct deals with suppliers). Less than one in ten (8%) members are franchise or host branded (business name is based on host agency or franchise) and just 6% survey respondents indicated that they are employees of other agencies. When it comes to specialty areas, ocean cruise continues to be the top specialty area among NACTA members. However, all-inclusive resorts, river cruise, specific destinations such as Anchorage, Hawaii, Cancun, Europe, Africa, etc. and tour packages are the other top categories as well. Speaking of selling specific destinations, NACTA members indicated that Hawaiian Islands, The Bahamas and Anchorage are the top destinations that they sell travel to among a list of over 20 destinations. Take a look at what we have to offer, which ranges from labor issues to GDS usage to financial benchmarking, at ASTA.org/ResearchReports. And don’t forget that ASTA membership includes preferential pricing for these reports, and in some cases complimentary access. Support your national trade association and join ASTA today! 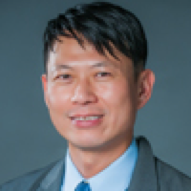 Kevin serves as Director of Research at ASTA since 2015. Kevin brings to ASTA over 20 years of professional experience with over 12 years in the travel and tourism industry, including at the U.S. Travel Association and Choice Hotels International, where he frequently shared research insights and information at conferences and seminars with his expertise in managing quantitative and qualitative research studies, projects and programs. Kevin earned his M.B.A. from the George Washington University and is a certified Project Management Professional (PMP).